Although no personal preferences are available for sales tax, company preferences do exist. 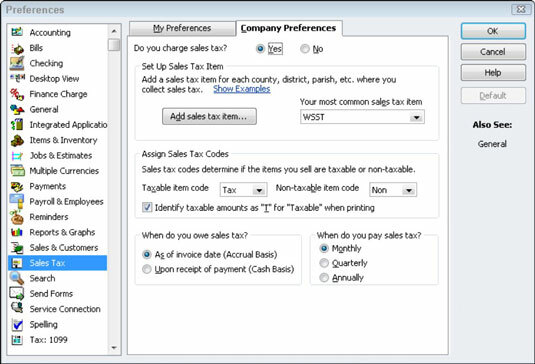 QuickBooks 2012 offers the Company Preferences tab for the Sales Tax Preferences set. The Do You Charge Sales Tax? radio buttons, which appear at the top of the tab, control whether you can charge sales tax within QuickBooks. You select the radio button — Yes or No — that answers the question. The Taxable Item Code and Non-Taxable Item Code drop-down lists let you define what code QuickBooks should use to identify taxable and non-taxable sales. By default, QuickBooks uses the clever “tax” code for taxable sales and the equally clever “non” code for non-taxable sales. However, you can select the Add New entry from either drop-down list and use the dialog box that QuickBooks displays to create your own taxable and non-taxable codes. The Set Up Sales Tax Items and Assign Sales Tax Codes boxes let you set up an item for the sales tax that you charge on invoices. You can indicate the default (or most common) sales tax item that you want to include by entering this sales tax item name into the Your Most Common Sales Tax Item drop-down list. To add the sales tax item, select the Add New entry from this drop-down list and complete the dialog box that QuickBooks displays. The New Item dialog box lets you name the sales tax item and identify the sales tax rate. You can also add a new sales tax item by clicking the Add Sales Tax Item button. The Taxable Item Code and Non-Taxable Item Code drop-down lists let you select the code words to designate invoice items as subject to sales tax. The Mark Taxable Amounts With “T” When Printing check box, if selected, tells QuickBooks to flag taxable amounts on an invoice with the code T.
The When Do You Owe Sales Tax? radio buttons let you indicate when the taxing authority says you owe sales tax: as of the invoice date (which means the taxing authority requires accrual-basis accounting) or upon receipt of payment (which means the taxing authority allows cash-basis accounting). The When Do You Pay Sales Tax? radio buttons (Monthly, Quarterly, and Annually) let you tell QuickBooks how frequently you must remit sales tax amounts. You select the radio button that corresponds to your sales tax payment frequency.